Amy Wright, who offers employment to people with intellectual and developmental disabilities, has been named the 2017 Hero of the Year. Hosted by CNN’s Anderson Cooper and Kelly Ripa, the 11th annual CNN Heroes: An All-Star Tribute aired live tonight from New York City. As a mother of two children with Down Syndrome, Amy Wright was dismayed when she realized that a large percentage of adults with intellectual and developmental disabilities (IDD) do not have jobs. Today, at Bitty & Beau’s Coffee, located in Wilmington, North Carolina, Wright’s nonprofit, ABLE to WORK USA, employs 40 people with IDD enabling them to earn a paycheck, gain a sense of pride, build relationships with the community and show that they are capable members of today’s workforce. Wright was presented with her honor earlier in the night by actress Diane Lane. 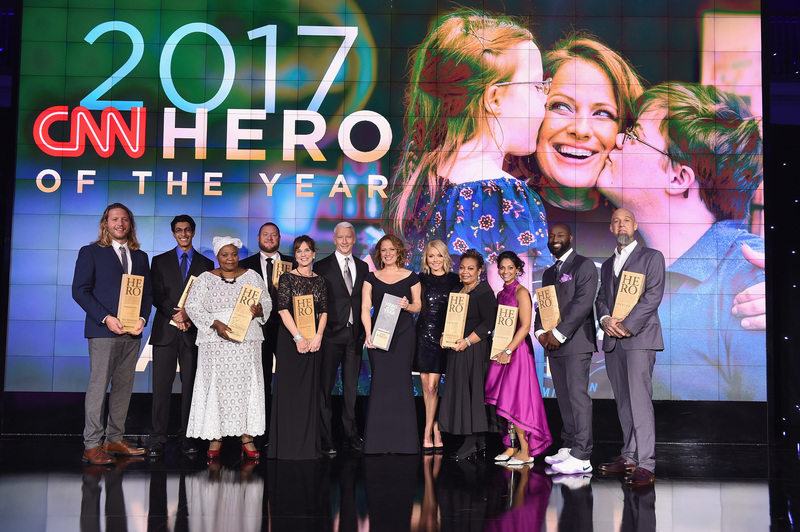 Each of the Top 10 CNN Heroes will receive $10,000 in recognition of their work. After winning the global vote, Wright will receive an additional $100,000 grant to further aid ABLE to WORK USA. The gala included celebrity presenters: Emmy award-winning actor Sterling K. Brown (“This is Us”), Oscar-nominated actress Diane Lane (“Paris Can Wait,” “Justice League”), Oscar and Grammy winner and hip-hop recording artist and actor Common (“Selma”), actor Christian Bale, author and Emmy-nominated actress Amber Tamblyn (“Paint it Black”), Oscar-nominated actress Alfre Woodard (“Luke Cage”), Grammy-winning and Tony-nominated actor Andrew Rannells (“The Boys in the Band”), Emmy-nominated actress Samira Wiley (“The Handmaid’s Tale”), Grammy-nominated comedian and actor Jim Gaffigan, Emmy-nominated actor Christopher Meloni (“Happy”), actor Gaten Matarazzo(“Stranger Things”), actress Brooklynn Prince (“The Florida Project”), and actor Iain Armitage (“Young Sheldon,” “Big Little Lies”).